This just might be the very first “new” recipe that I tried out right after Drew and I were married. I’d loved to cook for years before that, but cooking for my new husband was just so much fun! Casseroles. I love them for so many reason: they’re so tasty (I really don’t know if I’ve ever met a casserole that I didn’t like), they’re great leftover, and one-dish dinners make clean-up easy! But so many of the casseroles that I make are loaded with pasta or tortillas. This dish is light on carbs but still filling and easy! 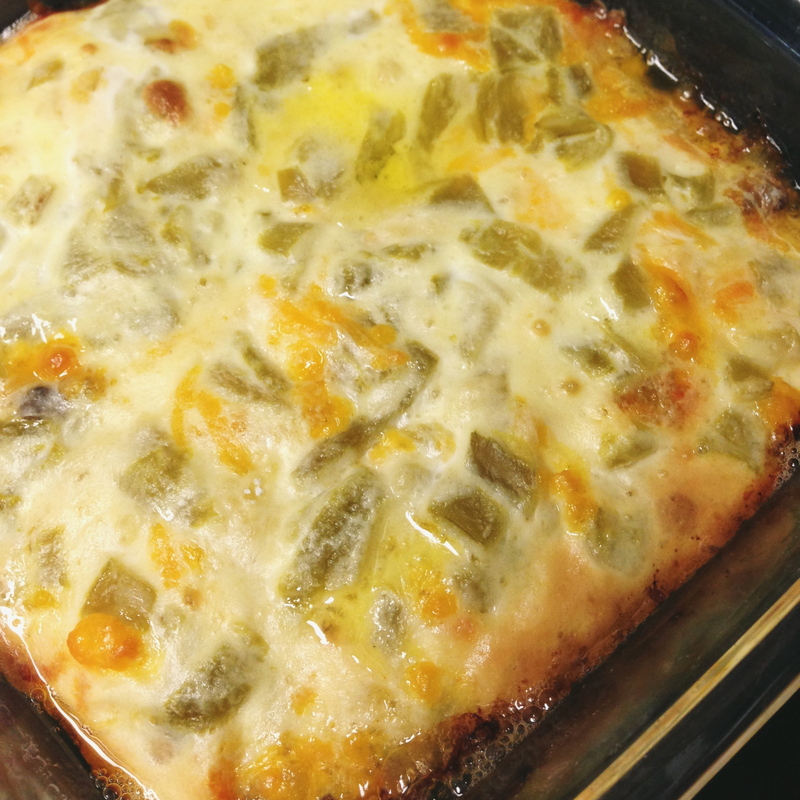 Green chiles are mild, so add some red pepper flakes if you’d like extra heat. This recipe was adapted from here. Note: My recipe is actually half of the amount of the original recipe, but it was still enough for us to make two meals out of it. 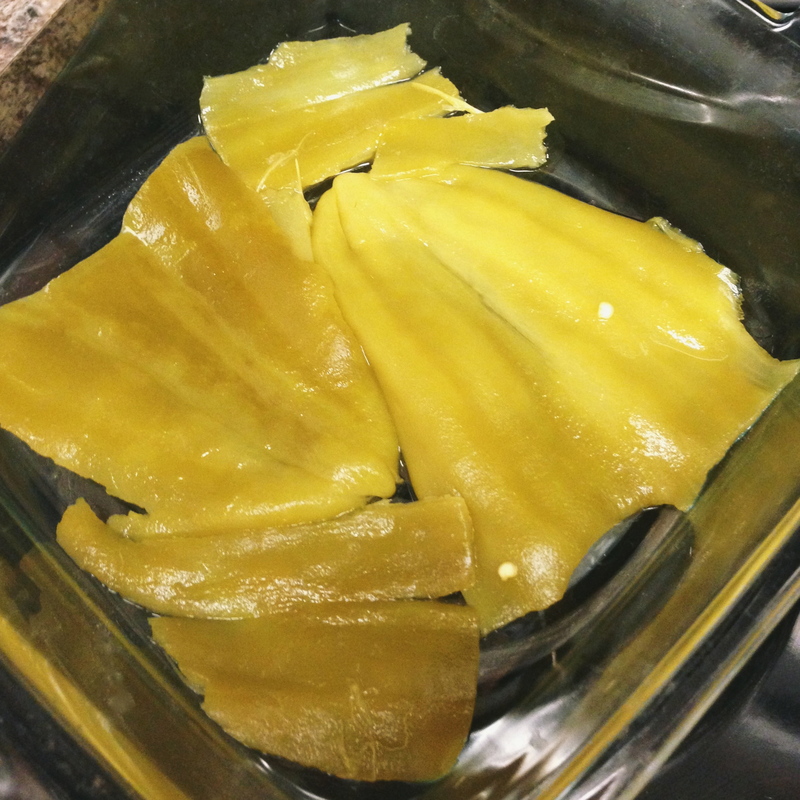 I baked this “half recipe” in an 8″x 8″ pan. This recipe has become a family favorite. Fast, easy and delicious. How good is that? i made this tonight, it was really good! I roasted fresh peppers instead and I also used sour cream instead of milk! It was really good! I think next time I might try putting crunched up corn chips to give it some crunch, maybe Fritos? Thanks for the great recipe! I have fresh roasted Hatch chilies in the deep freeze. I am totally making this tomorrow! YumO Thanks for the recipe! I’m making this tonight! I’ll add the sour cream. Yum! Made this last night. It was so yummy. Thanks! When I make Chiles rellenos I use Poblano peppers. I think I will sub with those cause they are sometimes spicy! Sounds delish though. Thanks for the recipe! How many poblanos would you use and do you roast them n peel them n cut them up? I just made this and waiting to pull it out of the oven. It smells fabulous! Thank you so much for the recipe. This was very good! I added sliced olives to the top, because I love olives on tacos, enchiladas. I agree with Melissa, some crunch on top would really add to the dish. Next time I will serve crunched up corn chips on the side along w/guacamole and sour cream. This sounds delicious. I will try this tomorrow. I would use carne picada instead of hamburger neat . Pepper jack & mozzarella instead of cheddar …. Made this for dinner and it was fantastic! 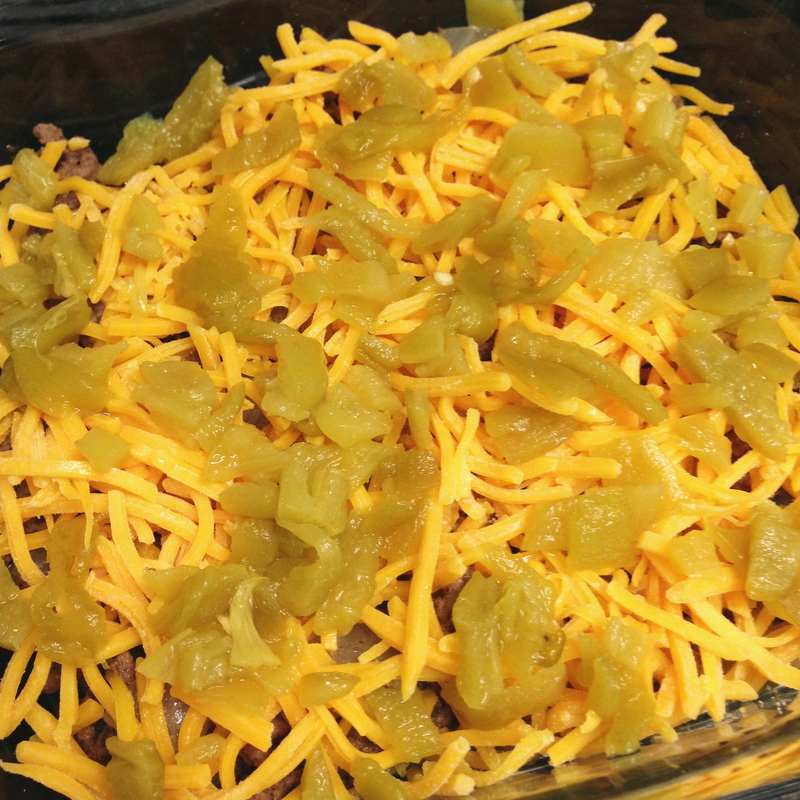 I agree with the crunch factor so I put crunched jacked jalapeno Doritos on top and it was AMAZING. 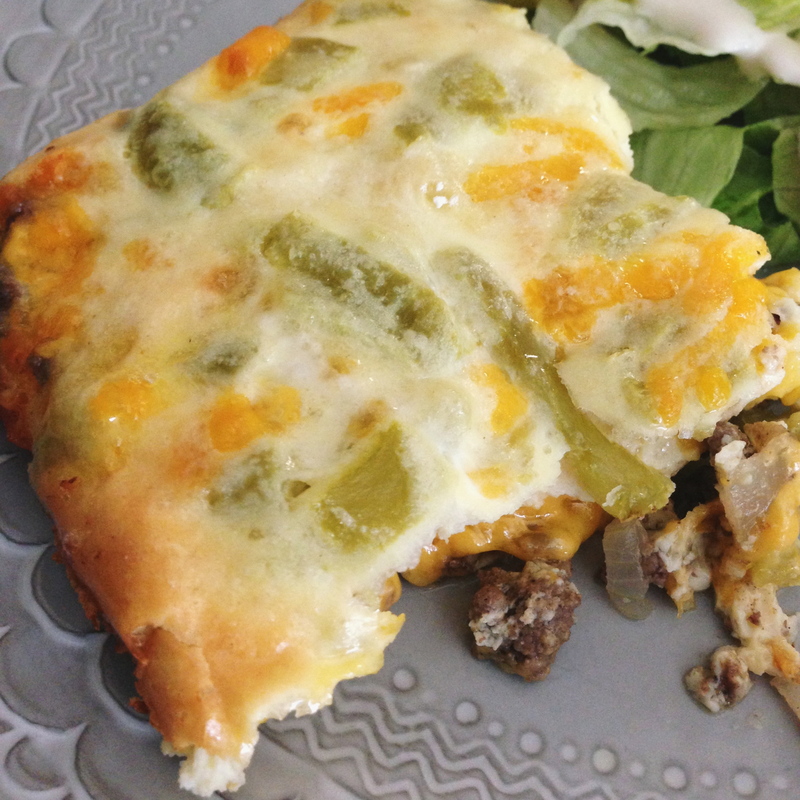 A must try for green chili lovers. I am going to make it this weekend. I will need to double the recipe as well. Did you have to add cooking time ? How long do you cook it for if doubling? Do you use a 13×9 pan when doubling it ? Made this last night, and altered slightly because of what I had on hand. I used 1 lb gb, and just a 7 oz can (drained) of diced green chilies on the bottom, because my store didn’t have whole. I also added a dash of chipotle powder for kick! Served with green salad, tortilla chips and sour cream on top. We will make again. Really love this recipe. Can you make ahead and freeze? Thanks so much for replying. I will make it then freeze it without baking. I usually have a cooking day and make up several at a time. I love all your recipes and have made several. I just made this for lunch and we loved it! Will definitely be making again! Anything with roasted chiles in it, we love. Thanks for sharing. I have made this many times, but with double the eggs. I am making it this time with fresh roasted anaheim peppers, breakfast sausage, topping with tater tots and sharp cheddar! On the side will be sour cream, salsa and guacamole. This will be Christmas morning breakfast with monkey bread for dessert! We make a casserole very similar to this every year for Christmas morning, but use Little Smokies for the meat. Our recipe has a lot more egg, but otherwise is pretty much the same. Try this recipe, folks, it will be a keeper for sure! everyone is talking crunchy topping..Do u crunch doritos before cooking or add after all done & ready to serve..Going to serve mothers day..So I take it if I doubled recipe it would fit 13×9 pan? I love this casserole!!! The flavors are wonderful–my husband loves it!!! Made this tonight it was super good. Do you add the crunchy chips for the top after it’s baked or for during the baking? Won’t they burn if you heat them with the rest of the casserole? Loved this ! Easy to make. I substituted a little cooked cubed white meat chicken. Family loved it ! Daughter used a piece of it to make a Chile rellano burrito. Yummy left over too! Could you make this with just cheese, no meat? It would make a great ‘meatless Monday’ dish. I’ve been making this for years and my family loves it. 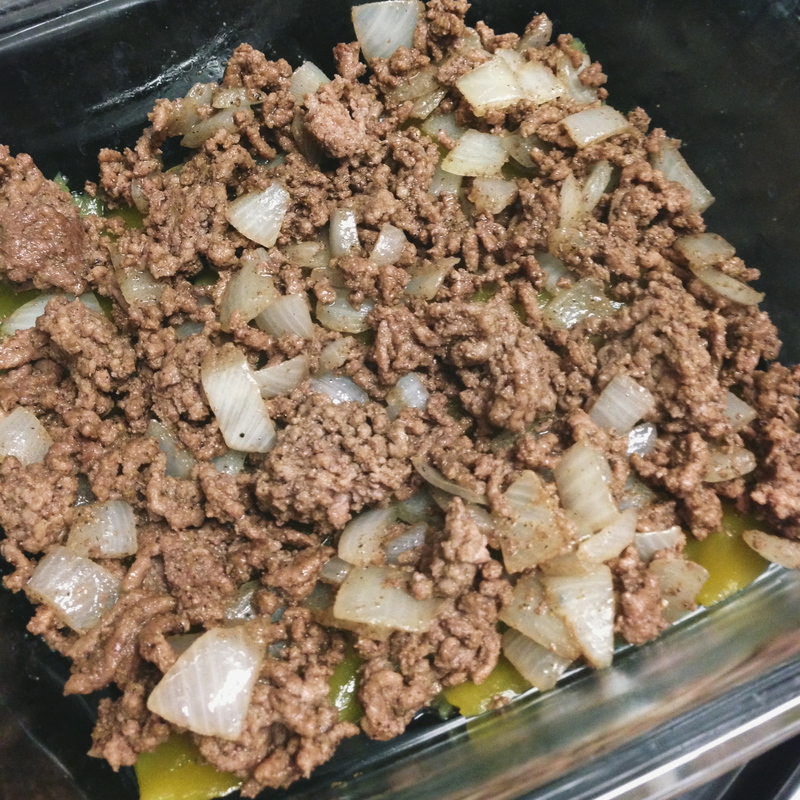 I often use half chorizo and half ground beef which helps add flavor to it. There’s never any leftovers. Previous Previous post: Hello Homebody // on facebook & etsy!